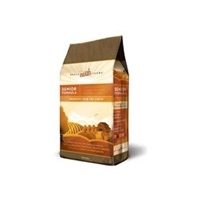 Merrick Whole Earth Farms Senior Dog Formula 5/8 lb. 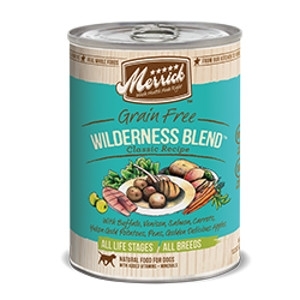 Merrick Whole Earth Farms Adult Dog Formula 5/8 lb. Merrick Whole Earth Farms Puppy Formula 5/8 lb. Merrick French Country Can Dog 12/13.2 oz. Whether it’s a corner café on the streets of Paris, a Cottage tucked along the French countryside or a trip up the Eifel Tower with your significant other, they all spell the romance of France. This savory delight inspired by the many culinary artists from across the pond will have your dog begging for more in a heavy French accent in no time. The Merrick’s say Merci Beaucoup. 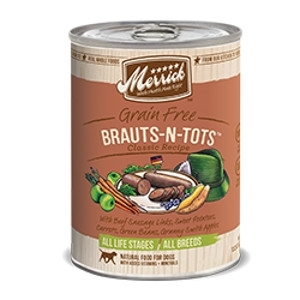 Merrick Brauts N Tots Can Dog 12/13.2 oz. 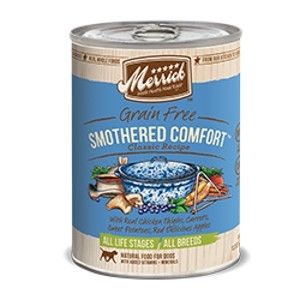 This dish comes with everything but the sour kraut, lederhosen and a stout pint of German ale. We’ve set the table and left the rest to your imagination. 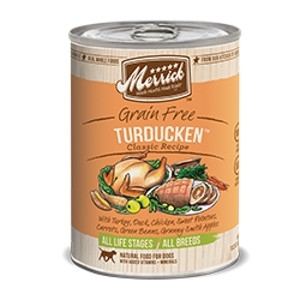 However, we do recommend that if your dog is of German descent to ease them into a dish like this or they might leave in the middle of the night to catch the next boat back to the homeland. The Merrick's would like to say Danke. Merrick Wild Buffalo Grill Can Dog 12/13.2 oz. It's winter in the Rockies at a quiet cabin with the one you love, a good book and a warm fire. The taste of the west is on the menu tonight. Buffalo and a host of tasty vittles are warming on the stove. The Merrick family is happy to share this original taste with your canine friend. The Merricks say Howdy and thanks. Wild Buffalo Grill is prepared with Buffalo, Cracked Pearled Barley, Zucchini, Carrots, Snow Peas, & Fuji Apples. Merrick Thanksgiving Dinner Canned Dog Food, 13.2 oz. 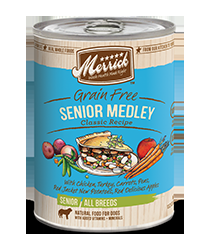 Merrick Senior Medley Can Dog 12/13.2 oz. The wise ones of the dog kingdom remember when dog food was a quarter, bones were free, and drinking from water hoses wasn’t taboo. We created a medley of flavors that come together to make a delicious gourmet chicken entrée that is sure to remind them of yesteryear. 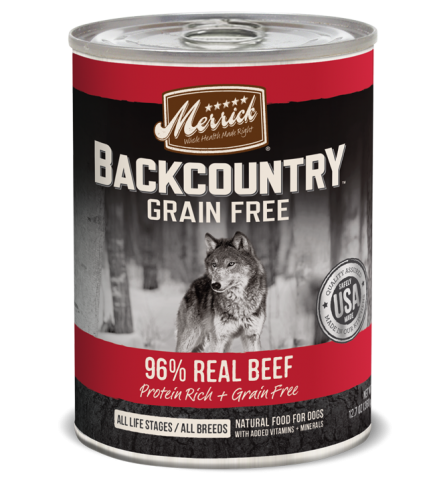 The Merrick family says live life to the fullest – these are the golden years! Merrick Puppy Plate Can Dog 12/13.2 oz. 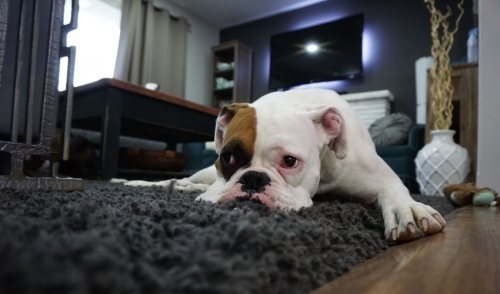 It’s the first lick, the wobbly crawl, and the yawns full of puppy breath that make us all love our puppies. 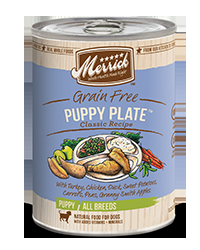 That’s why we created the Puppy Plate with plenty of high quality proteins to keep them healthy: Turkey, Duck and Chicken mixed with hearty whole grains, delicious vegetables and fruits. 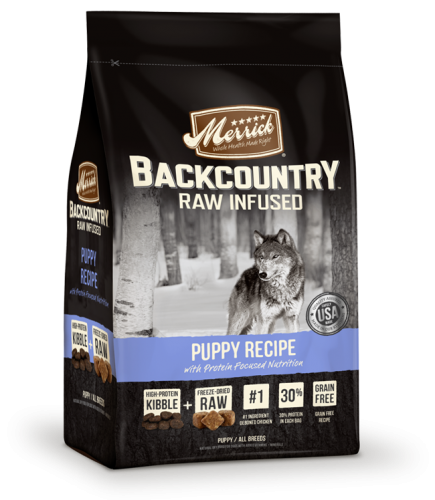 At Merrick we call it Puppyhood; don’t hurry too fast to grow up! Merrick Wingaling Can Dog 12/13.2 oz. Once upon a time there was a magical place called Wingaling and it had the best tasting chicken in the world.